Blue Cruise or Blue Voyage ("Mavi Yolculuk" in Turkish) is a term used for recreational boating tours along the Turkish Riviera in Turkey's south western coasts, with connotations in tourism and literature. The term is used by Turkey's tourism industry. It was derived from the title of a 1957 book by Azra Erhat. The term was first introduced into the Turkish literature by a handful of Turkish writers. These writers were Cevat Sakir Kabaagacli -alias The Fisherman of Halicarnassus, Sabahattin Eyuboglu as well as his circle of family and friends, especially artists, Azra Erhat, the translator into Turkish of Homer's Iliad and Odyssey, and others united around the literary revue "Yeni Ufuklar" (New Horizons) in the 1950s and especially the 1960s. 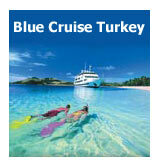 A full Blue Cruise generally starts in Didim, or Kusadasi, although the tours often depart from Bodrum. They usually terminate in the port of Antalya. The term may also be used to refer to shorter tours along the southwestern Turkey shore.